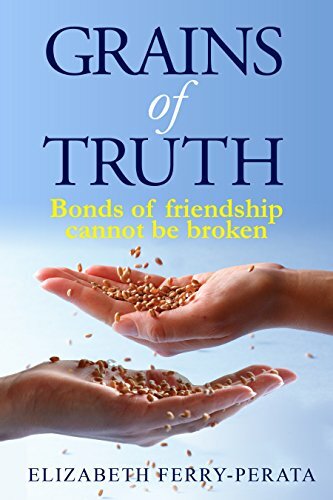 “Grains of Truth” by Elizabeth Ferry-Perata revolves around a small town in Texas where two friends learn to deal with the reality in life that no matter what they do, it will never be good enough for some. Each friend has their own past history of dysfunctional families, relationships and learning to accept that one can’t change everything. Sarah and Zoe are best friends fighting all the odds against them, especially in the perception of their “feed store” help label. According to Otis, owner of Otis Feed Store, both his female employees are the lowest of the low, and have no right to act like they are anything else. Tom, Otis’s son, has no back bone when it comes to standing up against his father. The plan is for Tom to marry Angela, daughter of another rich businessman so both fathers’ can merge their business interests. I found the initial intent of the story to be of interest, but felt there wasn’t a lot of depth to the characters, and found all the trivial conversations and events to be a distraction from the main theme. The topic of depression in relationship to the character Sarah, and her perception of continual rejection and failed relationships was of particular interest and I would have liked to have seen the author expand on this area of the narrative. This might be excellent information to provide to readers regarding some triggers. “Grains of Truth” was an easy read. Though the plot was somewhat predictable, I was not prepared for the ending. I found the relationship between Sarah and Zoe to be one that many of us only hope for. I loved that the ingrained thought that losing someone we love keeps us often not being able to accept that they are no longer with us. Overall I thought the book was touching; the underlying theme is one that many of us have experienced. There are some people who come into our lives for a short time but leave a lasting impression. I would recommend “Grains of Truth” by Elizabeth Ferry-Perata, as it will leave you to contemplate your own thoughts on what life, love and happiness mean to you.